605 p., 17,4 x 24,9 cm. Reuchlin’s ›Kunst der Kabbala‹ (On the Art of the Kabbalah) was published in 1517 in Hagenau by Anshelm and is dedicated to Pope Leo X. In this work, Reuchlin summed up his research and his thoughts on the Jewish secret doctrine of the Kabbalah. This work is a continuation of his previous thoughts from ›De verbo mirifico‹. It is set up as a dialogue, divided into three books, of which the first and the third deal with issues surrounding the Kabbalah whereas the second book deals with Pythagorean thought. In its time, this work was admired more – or also rejected more – than it was properly understood by scholars. 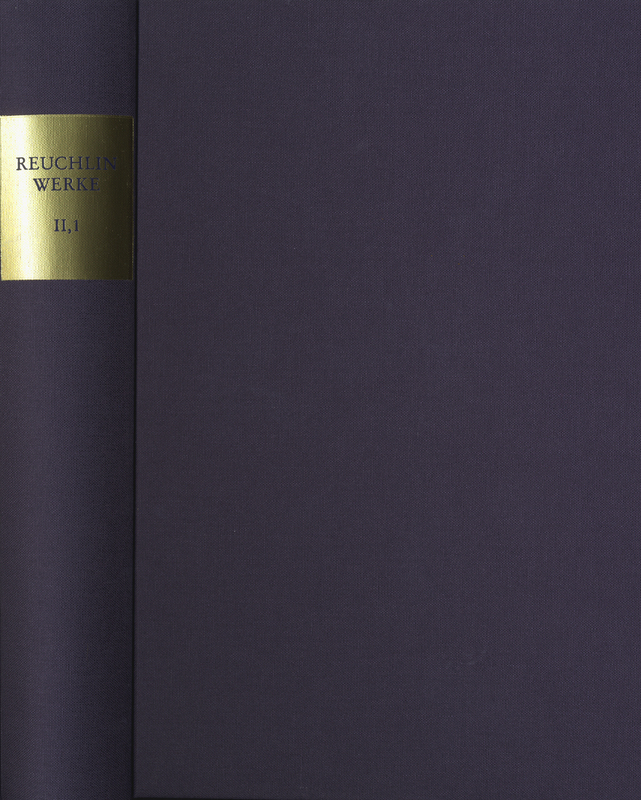 Nevertheless it could contain an important key to Reuchlin‘s thinking and his view of the world. This work, which is not easy to understand, will be published in the original Latin in a text-critical, edited version and with a transation into Modern High German which will be followed by a comprehensive interdisciplinary commentary. The careful edition [...] is faced by a fine German translation and accompanied by a host of well-informed notes that provide references mostly to classical and Hebrew sources. [...] Historians of the book will find a lot of material suggesting how secrets were divulged in the early years of the printing press, whereas intellectual historians may study textbook cases of more- or-less-deliberate misreading of tradtitions belonging to minority cultures in construction of majority identities. Hebraists will be interested to look closely at Reuchlin’s omissions and interpolations in his quotes from Kabbalistic texts. This edition is a very helpful tool for scholars of the history of literature, philology, philosophy, and theology, of church history, and of Jewish history. [...] Scholars will have a feast in working with this edition of the chief opus of one of the most important figures of polyglot humanism on the eve of the Reformation. Quant à la traduction allemande, réalisée par Widu-Wolfgang Ehlers et Fritz Felgentreu, elle est à la fois précise, claire et fluide, tout en respectant avec la plus grande attention le texte latin et le style de la langue de Reuchlin. Enfin, les différents caractères grecs, hébraïques, latins et allemands qui ont été choisis sont magnifiques, la mise en page et la disposition du texte généreuses, bref, une édition exemplaires à tous égards que nous saluons avec enthousiasme et admiration.